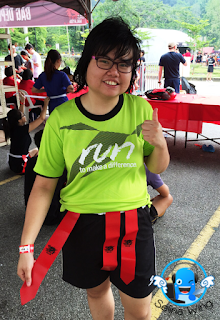 Run For Your Lives Malaysia 2015 @ Penang - Chase by Zombies! 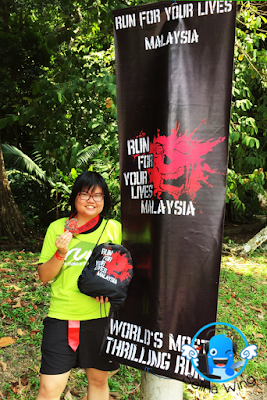 When we reached the Penang Botanic Gardens, many zombies and participants always around the Run For Your Lives Zone...Ahhh! I saw some local runners and tourists like to take photo with the zombies when they come to visit Botanic Gardens or enjoy to jogging in the early morning! My sister and I wonder how they make up as zombie do by themselves? We saw the professional make-up staffs keep to focus on the make up on the participants and volunteers as Zombies! They enjoyed to "paint" the red blood on the face and body! Haha. Before join this, I think that I interested to become Zombie, but my sister don't want to be "ugly" if she become zombie! It's fine for us to become Survivor, we have to face more obstacles along 5km! Anxious to face the Zombies? Yeah! This is real life where you run for your lives going through waves of zombies~! Just like in video games which we played! My sisters and I can played the horror games and watched the ghost movies too! 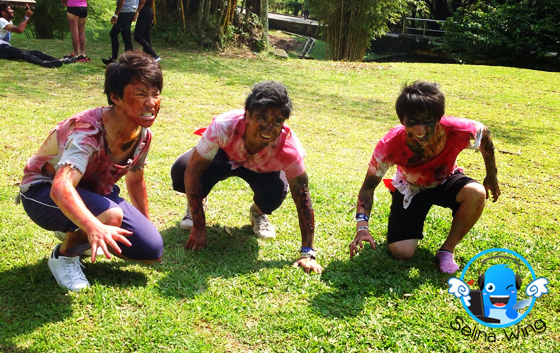 I not scare as I busy to run but, I enjoyed to see how Zombies keep to chase the Survivors until the end! Each survivor get 3 lives. So, they have to take care of their lives when they meet the zombies! I got 3 pieces of long red plastic strip which the zombie will chase from the Survivors' waist. 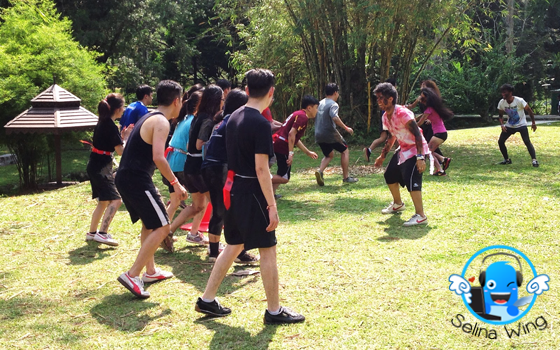 We have to cross the obstacles, like Blood Pit, SmokeHouse, Holey Trap, Laser Grid and others...Then, there are few zombies zones along the 5 Km run so serious! Sometimes, we are depending on our luck if the not see our red strips on our waist..Haha The Zombies will chase who as they want! I saw the survivors fell down so serious! Their legs get injured! 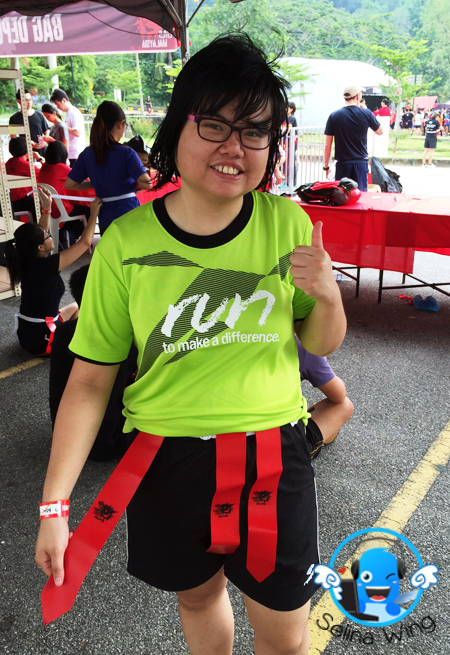 Sometimes, survivors get to vomit during they are very tired from their running so faster! 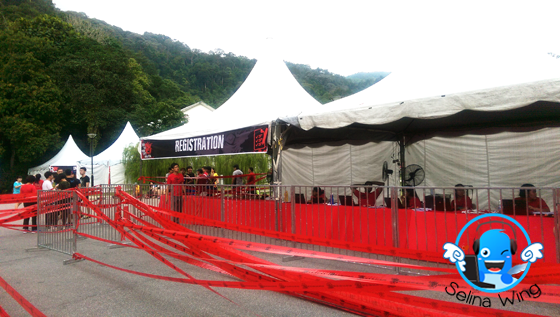 The long queues at the starting point. Survivors are released in batches into the wild and zombie infested garden. 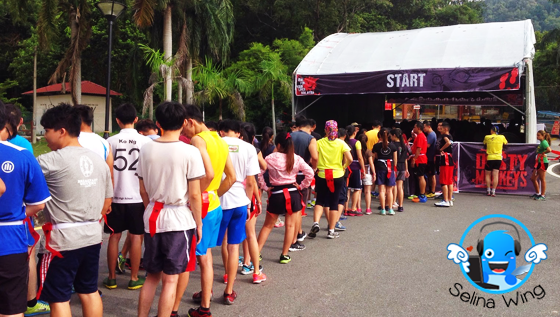 There are many time slots are arranged for each group Survivors waves, from 8am till 12 noon only! Sorry, I don't take more photos on the obstacles as I don't bring my own smartphone during my sister and I busy to run along 5km! If you are tired, you canchoose to skip an obstacle, and still be able to complete the race. If 3 life taken by Zombies already, you still have chance, then you can complete an obstacle "Let Bodies hit floor", which sponsored by CatchTheBus, then staff will give +1 life for the Survivors complete it! 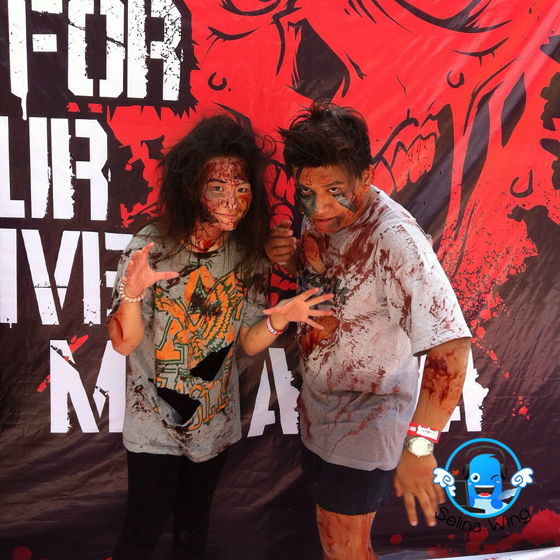 Thank you to my partner, Jocelyn who sacifice to give +1 life for me because I almost lost my lives to the Zombies! Luckily, I don't be "Infected" Zombie! Haha! 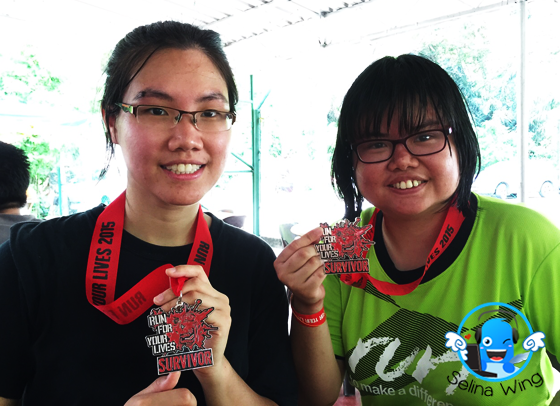 Finally, we success to complete our 5km in Run For Your Lives Zone! But there are two types of Medals; "Survivor" medal and "Infected" medal. The Survivor will get "Survivor" medal if they manage to show that you still have your life with you but if all lives are taken away by zombies you will get "Infected" medal. My sister and I got the goodies bag from the booth! I surisped that all vouchers only can be available in Penang, too bad my family and I cannot come to Penang always. 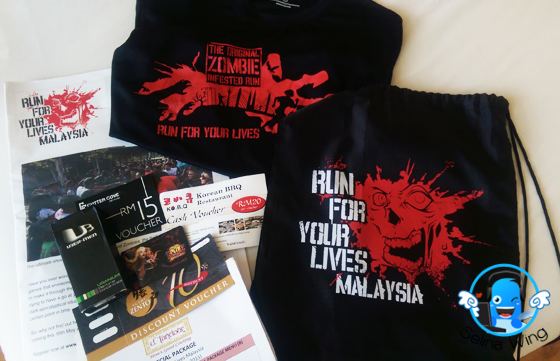 I was happy to get FREE T-shirt "Zombie - Run For Your Lives" and black bag, be enough! My good friend, Ani Choo came to visit me at the hotel then, I give the vouchers to her, and asked her to bring her family to try Japanese and Korean BBQ restaurant in Penang! Thank you for Ani who helped to guide my family and me to visit around Penang so much! Interested in the Zombie Run as you BRAVE? Yes! Next year, come to join the Zombie Run 2016 again! 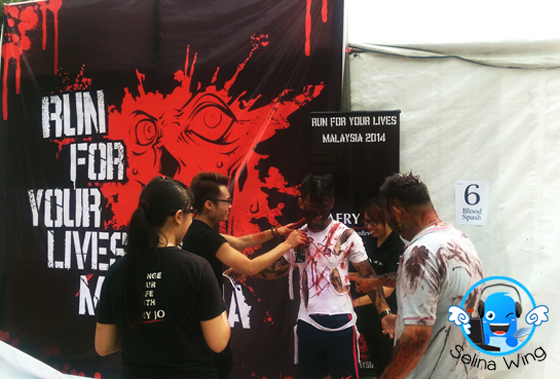 We enjoyed the Run For Your Lives Malaysia on this year!